A free badge bearing the exhibition logo is available by sending an SAE with a 32p stamp to 8 Kildare Road London E16 4AD (email me if you want to order from outside the UK). A free pocket mirror is also available. This looks like the badge but is larger, and the logo has been altered to read NORMAL. Substitute a padded envelope if you would also like one of these. 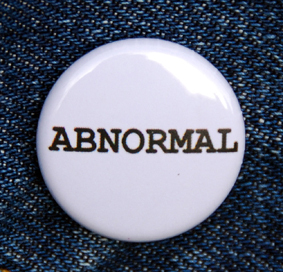 If you would like to label yourself as ABNORMAL or reassure yourself that you are actually NORMAL, please get in touch.